Searching for Bonobo in Congo » What the Trees in Congo’s Forests Tell US. What the Trees in Congo’s Forests Tell US. Once, Belgians had the prize research network in Africa. Founded in 1933, their INEAC (Institut National pour l’Etude Agronomique au Congo) had 32 research centers in what is now the DR Congo. 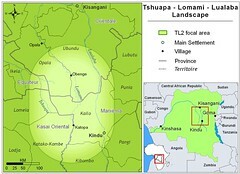 Each center had many buildings, research plots, European researchers and Congolese technicians. John and I scoured INEAC publications while seeking background information for our PhD dissertations. I was frustrated. The Belgian botanical ecologists clung to their European understanding of plant associations. They pushed and squeezed Congolese forest diversity into a Braun-Blanquet model where the plant association is one hierarchical step up from the plant species and can be just as completely defined. A given association was known by its dominant species and associated with an invariable set of environmental (soil, climate) factors. This Braun-Blanquet system did not work in Congo, not even, and maybe least of all, in a forest dominated by a single tree species. I was trying to understand one such forest, the mbau forest, and its transition to a mixed forest in the Ituri watershed. 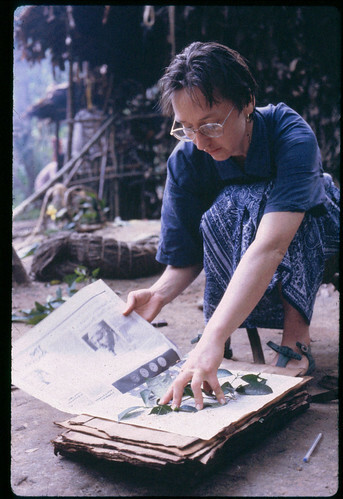 In the 1980s I started a herbarium collection in a forest camp at the transition between mbau forest and mixed forest. John told me about having lived in mbau forest when he was doing his Pygmy research further south (1973-1975). At that time I was a Peace Corps volunteer on the savanna. He said the mbau tree formed the canopy and filled the understory with saplings waiting their turn. We found the same phenomena in the mbau forest of the Ituri. I was a young botanist, taught like all botanists, that tropical forests were extremely rich in species and that the temperate forests were much poorer. So why was there so much of this mbau forest in Congo? The Belgian literature did not help understand transitions from a more mixed forest to mbau forest. The Braun-Blanquet method of forest description is the problem. Small plots of fixed size, or relevés, are used and all strata are treated equally with complete lists of abundance, including even the mosses. How could anyone do enough relevés to know what big trees were present in a forest while also doing a complete sample of the myriad climbers, epiphytes, herbs and mosses? It seemed illogical to me. For big trees many hectares are required to know what is present, but for the smallest plants even a few square meters can take days of work and have very different species from an equal area in the adjacent hectare. I did not believe that all of these strata and species varied together, but rather that each species had its own means of dispersal, physical tolerances, set of predators and, in consequence, a unique distribution. The European landscape that the Braun-Blanquet plant-association system grew out of is not only vastly less diverse than the tropical landscapes, but also has only small patches of undisturbed vegetation. These grow on wetlands, rocky outcrops, or slopes too steep to cultivate. How could this system be useful in a vast tropical forest where great vegetation changes happen with little substrate change and where a single species dominates on many different substrates? But INEAC publications continued to insist on a Braun-Blanquet system of phyto-sociology throughout the first half of the 20th century – then there was independence and the Congo Rebellion of the 1960s. The majority of forests were never sampled and nearly each one of those sampled did not fit into an association of anything sampled earlier. This post is a tribute to the INEAC researcher Philippe Gérard to whom I also dedicated my dissertation with these words: “whose enjoyment of mbau forest is alive in his writing.” His publication was the one inspiration – and a considerable one – in the INEAC literature. During the colonial period and as a young botanist, Gérard too had come under the spell of the mbau forest. It was unlike any other forest – more Romanesque than Gothic, as golden as it was green. 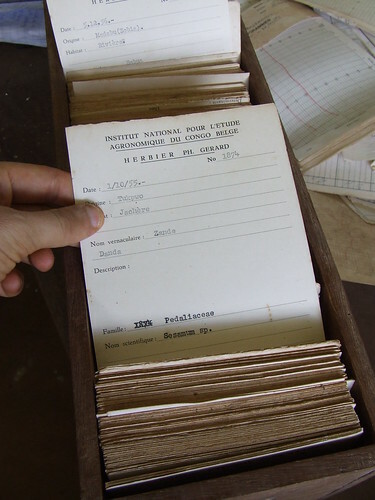 The catalog of Philippe Gérard’s plant collection at the Bambesa INERA station. Photo by Cleve Hicks. Philippe Gérard had only one publication, in 1960; it was about his study of mbau forest. I used it in my dissertation, and then moved on to other things. John too had finished his doctorate; we returned to Congo to study Okapi, to look at plant phenology and, now, across the Congo River, to work for conservation among bonobos, along the Lomami River. It was a surprise to find pockets of mbau forest along the Lomami as well, but that is not what made us think of Philippe Gérard and decide to write this post. It was an email note from a young researcher studying chimpanzees in northern DR Congo, Cleve Hicks. He had just been to Bambesa: amazing rambling ruins, he said, that had once been a research center for the Belgians. The Congolese technicians that were still there spoke of Gérard. They showed Cleve the thousands of plants he had collected, their catalogs with not only Latin names but also local names. They said that all the Belgians left INEAC at independence except Gérard who stayed through the bloody war that followed. That story we will never know. He stayed on until 1972 when he left, and died soon afterward. He was probably little more than 50 years old – if that; it was only a few years later that John and I started our studies in the Ituri Forest. 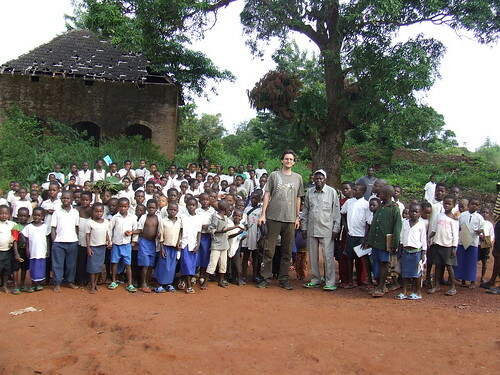 Cleve Hicks at INERA-Bambesa surrounded by the next generation and with the crumbling INEAC buildings behind him. For more photos of botanical work in the Ituri Forest and Cleve’s visit to INERA-Bambesa. For photos of mbau forest taken along the Lomami River by our field teams. For a look at my dissertation from the Ituri Forest’s Mbau Stands. This entry was written by Terese Hart, posted on 2009-10-04 at 5:24 pm, filed under The Forest. Bookmark the permalink. Follow any comments here with the RSS feed for this post. Post a comment or leave a trackback: Trackback URL. Any pics that could help us imagine what a mbau forest looks like in comparison to others? Great piece, Terese! It brings back some funny memories. There were no longer whites anywhere around Bambesa. The older folks remembered the Belgians, but to the children white people were some kind of mysterious legend that they’d mostly only heard stories about. When I arrived I felt like the Beatles must have, surrounded by dozens of screaming little fans! Kids were hiding in cracks in crumbling walls to peek at me …’Look, see , the mondele eats food too!’ followed by gleeful giggles. One poor little fellow (5 years old?) in the bush began howling with fear when he saw me. His papa explained that the only white person the kid had ever seen was a giant crucified effigy of Jesus, streaming fake blood, pinned on the side of a nearby church. With my beard and long-ish hair, apparently the boy got a bit confused! One of my favorite times in the forest is during the masting season, when the Gilbertiodendron seed pods began exploding over your head and the shiny brown seeds rain down everywhere … followed soon after by little green mbau shoots poking up in row after row, some of them still wearing their seed house as a ‘cap’ … I miss the forest! Agreed. The mast is marvelous, with the popping pods and the flat hard seeds that fill the palm of your hand. They are edible too! It is the mbau mast that saved Stanley’s expedition from starvation. Soaked to remove tanins and then boiled they are chewy and addictive. They make a good ugali as well. I didn’t know that about Stanley! He was lucky he was there during the masting (but I guess many of his Congolese victims weren’t!). I remember that chimps and gorillas gnawed on them at Mondika, CAR, but the Bili apes didn’t seem to. I have never tried cooking them. I am curious about the taste! It’s interesting you call them ‘mbau’ … in Azande land they call it ‘ambalu’, which sounds very similar! I admire the work you have been doing. I have a question for you. Have you ever collected or noted any Amaryllids ?